The rising sun (in the east, which is left and behind the viewer) provides warm tones to this scene, with shadows falling to the right of figures and objects. Moses, the man we saw him paying in the previous scene, and two of the camels in the man’s caravan. I wanted to show a scene demonstrating the vast expanse of desert that Moses crossed, to escape Egypt, on his way to the land of Midian. 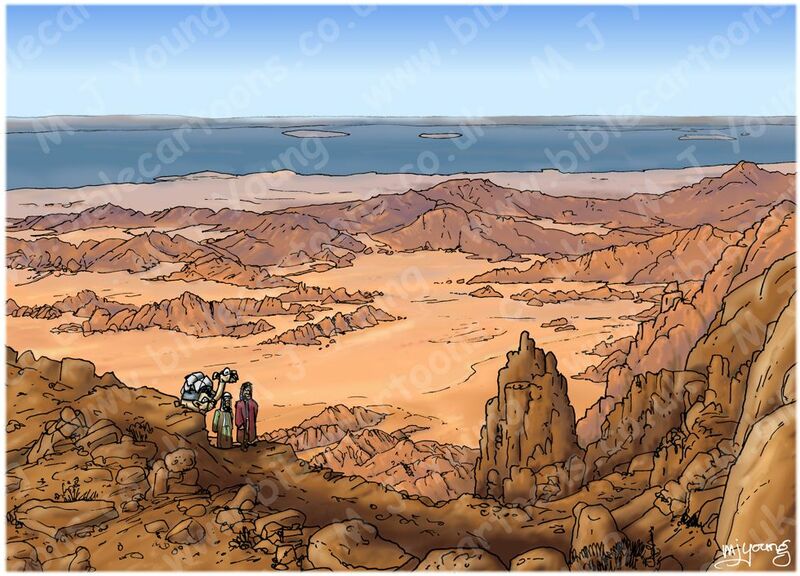 To do that I have drawn the figures in the foreground quite small, compared to the rocks, desert plain and the rest of the landscape. 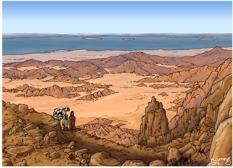 In the background you can see the Red Sea, and Egypt is the land on the horizon. I imagine that Moses may well have headed north through Egypt, probably following the River Nile until he reached the Red Sea. Then he might have continued on well known trade routes out of Egypt. But you could argue that Pharaoh would expect him to do that, and send soldiers to capture Moses and bring him back to Pharaoh. It is therefore quite possible that Moses didn’t travel on the more obvious trade routes, but struck out on some more minor, less travelled roads, seeking to avoid capture by Pharaoh’s soldiers. If that were the case, then I have reasoned Moses may have headed into the Sinai Peninsula, perhaps travelling south on the west coast of the peninsula, which would take him towards Horeb, the mountain of God, in the south. 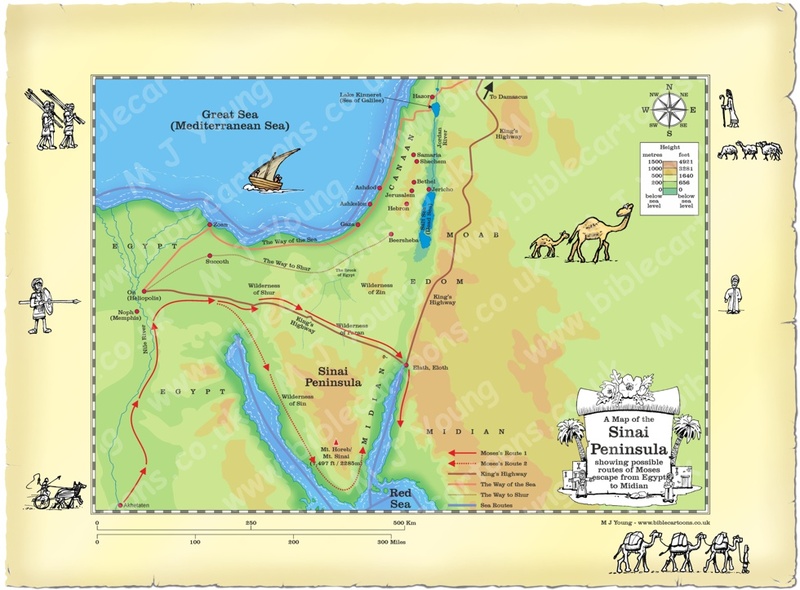 The scene I have drawn is from the southern region of the Sinai peninsula, looking east, over the Red Sea, towards Egypt, somewhere near the label “Wilderness of Sin”, to the left of the label “Sinai Peninsula” on the map below.